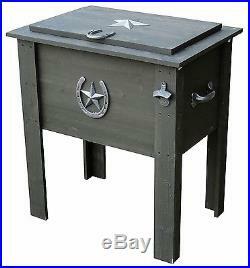 Rustic Country Cooler 54 Qt Vintage Ice Chest Bottle Opener Picnic Patio Outdoor. The 54 Quart Country Cooler is mounted on four post legs to elevate it, a feature your friends and family will love. This NEW and improved cooler has a polyurethane inner liner that prevents leaks from forming, an attached bottle opener and drain valve for emptying or cleaning. The rustic grey wash finish with the decorative horseshoe and star design gives this cooler a “southern feel”. The hardware is powder coated to prevent rusting. Perfect for camping, a backyard barbeque or tailgate party. 54-Quart capacity with a one piece polyurethane inner liner. Feature a handy bottle opener and drain valve for easy emptying. Powder coated hardware to prevent rusting. Rustic grey wash finish. The item “Rustic Country Cooler 54 Qt Vintage Ice Chest Bottle Opener Picnic Patio Outdoor” is in sale since Monday, February 15, 2016. This item is in the category “Home & Garden\Yard, Garden & Outdoor Living\Outdoor Cooking & Eating\Ice Chests & Coolers”. The seller is “roethlisberger_07″ and is located in US. This item can be shipped to United States, Canada, United Kingdom, Denmark, Romania, Slovakia, Bulgaria, Czech republic, Finland, Hungary, Latvia, Lithuania, Malta, Estonia, Australia, Greece, Portugal, Cyprus, Slovenia, Japan, Sweden, South Korea, Indonesia, Taiwan, South africa, Thailand, Belgium, France, Hong Kong, Ireland, Netherlands, Poland, Spain, Italy, Germany, Austria, Russian federation, Israel, Mexico, New Zealand, Philippines, Singapore, Switzerland, Norway, Saudi arabia, Ukraine, United arab emirates, Qatar, Kuwait, Bahrain, Croatia, Malaysia, Brazil, Chile, Colombia, Costa rica, Dominican republic, Panama, Trinidad and tobago, Guatemala, El salvador, Honduras, Jamaica.